Let's assume for the moment that there is an extra glob (How's that for a technical term!) of rubber on the edge of the tread of a tire - and that the tire is mounted on a rim and inflated. If this glob has significant weight, it could cause a vibration in the vehicle. Let's assume the glob weighs 1 ounce, that the tire is 30" in diameter and the tread is 6" wide, the rim is 15" in diameter and the rim width is also 6". Just to get a bearing on things, a 1 oz. glob of rubber will have a volume of about a strip of rubber 3" wide, 12" long, and 0.05" thick. The force is proportion to the diameter. This means that if the weight we add is at the rim diameter, then it has to be more that if we apply it at the tire tread. In our example, the 1 oz weight at the tread surface (30" diameter) is counteracted by TWICE the weight (2 oz) at the rim diameter (15"). This also means that, all other things being equal, the rim creates much less imbalance than the tire does. The force is proportional to the mass. This means that rims, which are machined and generally have less dimensional variation, would generate less imbalance than the tire, which is molded and inflated. The tire has more opportunities to be dimensionally more variable. The force is proportional to the SQUARE of the speed. This means that more care needs to be taken for racing tires than for street tires. I am going to use the phrase "assembly" to mean the rim with a tire mounted on it, inflated, and all the ancillary components needed to make that work, such as the valve. I am also going to use "tire" to mean only the rubber part of the assembly. But I am going to use "rim" to mean the thing the tire is mounted on. Some of you may object to that and want to call that a "wheel" - and I am not unsympathetic to that. However, I want this to be as clear as possible and I have found that most people with understand "rim" to mean what I want it to mean, and "wheel" less so. Sorry if this annoys you. This is also known as "bubble balance" since one of the devices used is a form of a level. It has a bubble floating on a liquid under spherical glass plate. The plate is usually graduated so the amount of the balance weigh needed is easy to determine. If you look above this, you'll see a photo of a bubble balancer. Unfortunately, it's the other type - the ones with just a "Bulls Eye". When I find a better photo, I'll change it. Since the weight needed is to be mounted on the rim flange, how much weight is needed? The assembly is 15 in-oz out of balance, so to compensate for that at a 15" diameter (7½" radius), the weight has to be 2 oz. Put the weight on the outside? 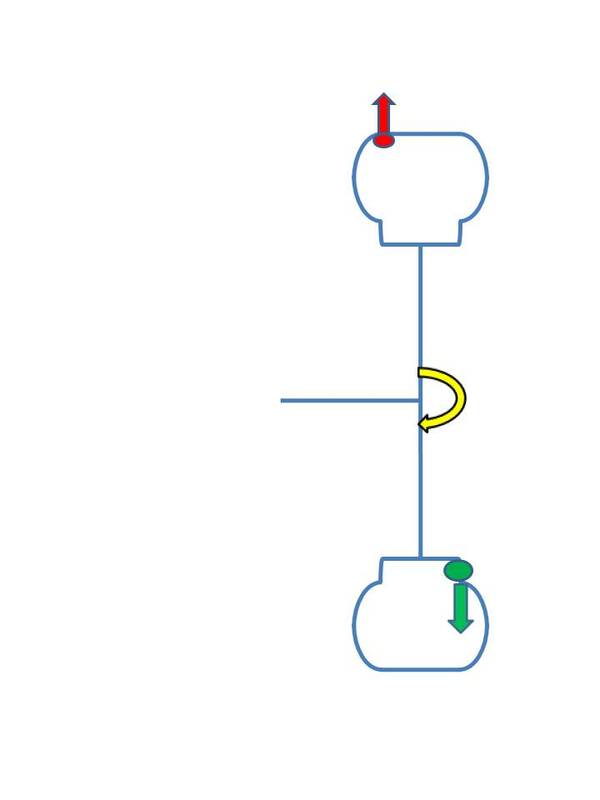 When the 2 weights revolve that introduces an oscillating moment (torque) at the axle - illustrated by the yellow arrow. This, of course, causes a back and forth twisting action, - and a vibration. Split the weights between the inside and outside? That's better, but there is still a moment at the axle, albeit half the value compared to above. In our case that works exactly the way it should. It completely balances everything and does not introduce a moment at the axle. Notice that we've handled both the static balance as well as the dynamic couple. It should be obvious that dynamic balancing is always better than just static balance. You could call this "out of round". This is where one or more of the components is not round. It could be the rim, or it could be the tire, but the net result is the assembly is not round. This can take many forms, including a flat spot, off center, etc. In the case of the photo to the right, the rim was obviously bent. Putting a tire on this rim is not going to make the situation better. 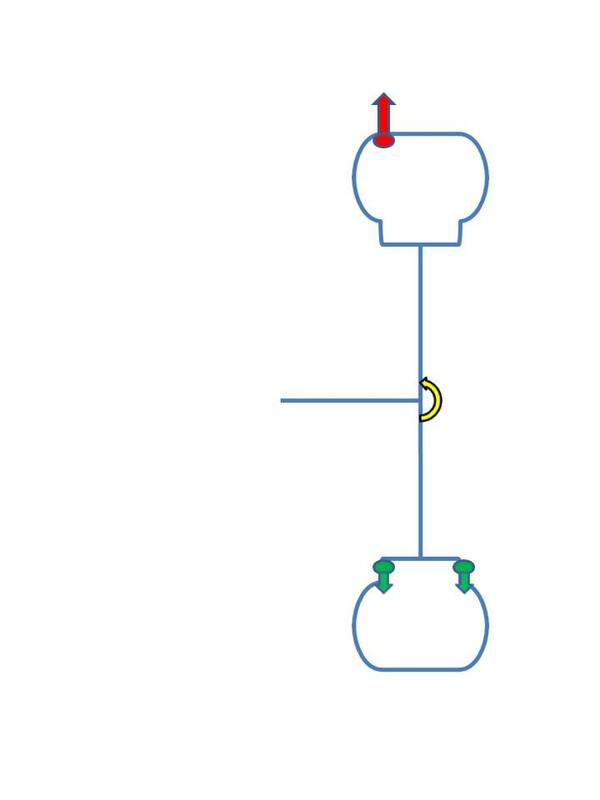 You can also measure the runout of the assembly - as indicated by the photo to the left. The problem here is that this merely measures the unloaded assembly, and that doesn't cover the whole story. This is sometimes called "force variation" or "road force", but it means the same thing. This is a little more complex. If you imagine a tire as a series of springs and as each spring comes into contact with the ground, it deflects according to its spring rate. Since each spring has a different spring rate, there will be different deflections around the tire. I've tried to indicate different strength springs around the tire to exaggerate the differences in spring rate. > We could measure this in a number of different ways. 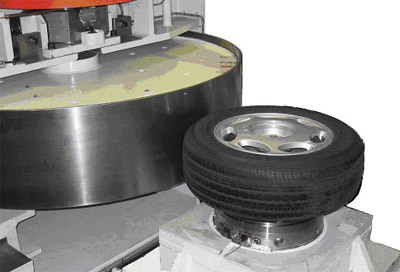 Because the vehicle "feels" the force, this is the most common way - and the way tire companies measure it - with a Tire Uniformity Grader (TUG). Notice how large the road wheel is. These machines are big, heavy, and highly precise. The last time I asked (about 2005) the price tag was over $600,000 each. Needless to say, they are beyond the price range of an ordinary tire shop. 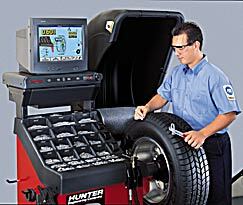 However, there are several machines which are within reach of a tire shop - most notably the Hunter GSP9700. Probably the biggest disadvantage of these machines is the small load wheel. Because the road surface is flat, any wheel is going to emphasis a smaller area of the tire - and misread nonuniformities spread of a large area. Nevertheless, they are good for their purpose - sorting out which assembly may be the problem assembly. Here's a simulation of what you get when you measure a tire on a uniformity machine. This is a plot of degrees vs force variation. Peak to Peak the values range from +14 to -18. This would be called "Composite". Normally, we think of "up-down", "left-right", "near-far", commonly called Cartesian Coordinates. But tires have a peculiar symmetry and you can use this to advantage. You look at the front of the vehicle, side to side is commonly called the "lateral" direction - and that applies to tires as well - the Red arrows. If you look at a tire from the side it is a circle. You can reference any part of the circle and the tire is the same. So coming out from the center is known as the "radial" direction - the Yellow arrows. 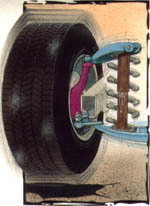 The contact patch is directly under the hub, so from the perspective of the vehicle this becomes the up and down direction. Lastly, the front to back direction from the vehicle's perspective could be called "Fore - Aft", but from the tire's perspective this could also be the tangential direction - the Green arrows. 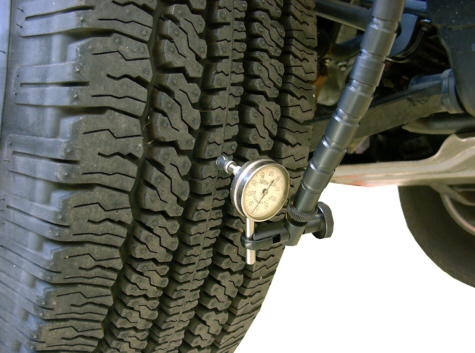 One peculiar aspect of vehicle suspensions is known as "wheel hop frequency". It's the resonant frequency of the suspension - which is in essence a "spring-mass-damper system". If done correctly, a vehicle will have spring rates and damping coefficients such that the wheel hop frequency occurs somewhere in the 50 to 70 mph range. 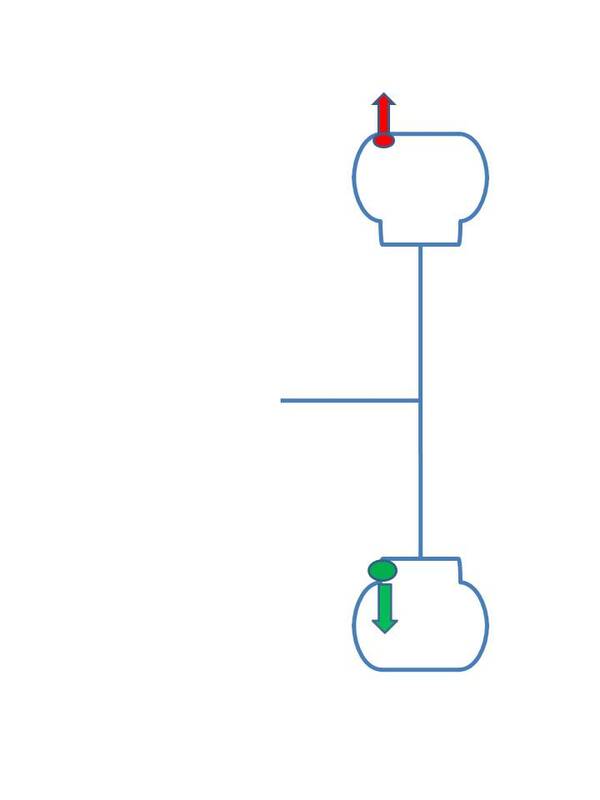 At the particular speed, a repeating force can set off an oscillation - a vibration. An imbalance can do that - OR - the first hamonic of radial force variation. First Harmonic means the once per revolution contribution of the composite waveform. Obviously, the 2nd Harmonic is the twice per revolution contribution. And so on. There are an infinite number of harmonics. The good news is that for tires (rims, too! ), the 1st harmonic is usually much larger than the 2nd, which is much larger than the 3rd, etc. Here's that same simulation from a uniformity machine - but I've added the first harmonic. It's a "best fit" sine wave. There are several mathematical techniques that can be used to determine what the best fit is - and in particular, it's magnitude. I'm not well aquainted with them, and you're probably not interested anyway. So let's just agree that we'll accept that it can and is done. Wheel hop reacts to the up and down force - or put into tire coordinates, the radial direction. We abbreviate the 1st harmonic of the radial force variation as "R1H". 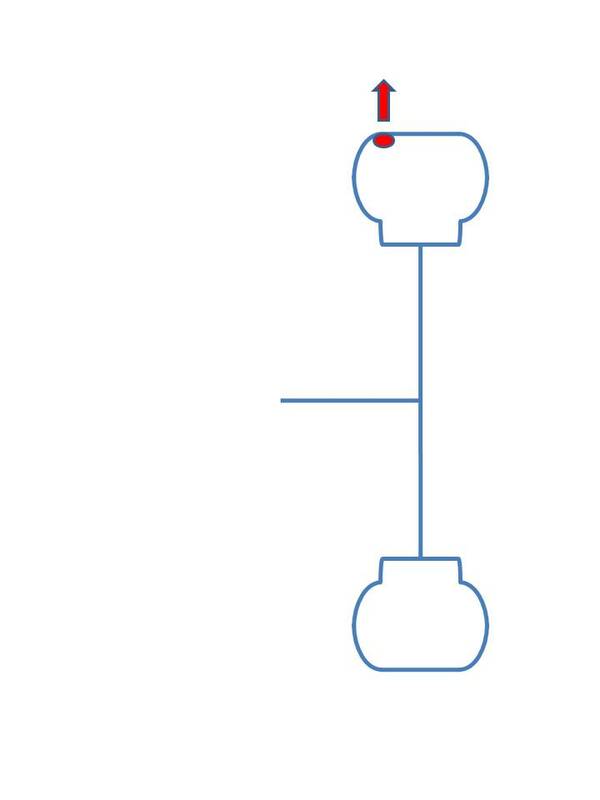 This value become really important in quantifying if an assembly is too high. 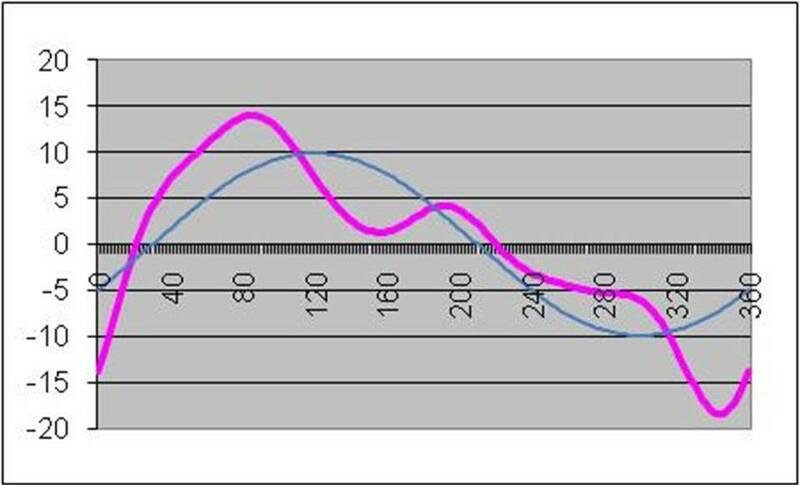 The magnitude of the composite curve (pink) is much larger (+14# to -18# - average = 16#) than the first harmonic curve (blue - ~10 pounds) We tire engineers would call this a 10# tire, since it is the first harmonic is the one that drives the vibration. The 1st Harmonic's peak does not line up with the composite's peak. In fact, it is in quite a different location. 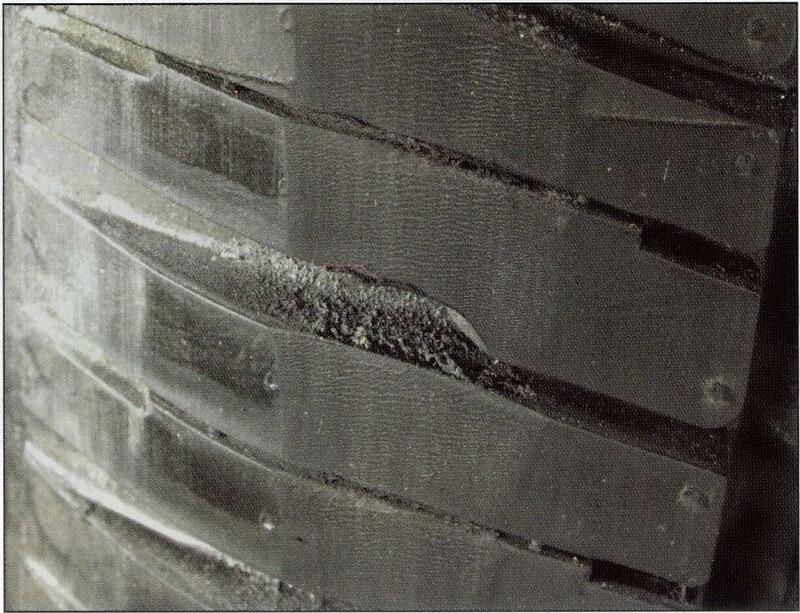 That is one of the reasons why doing runout on a tire does not always yield good results. 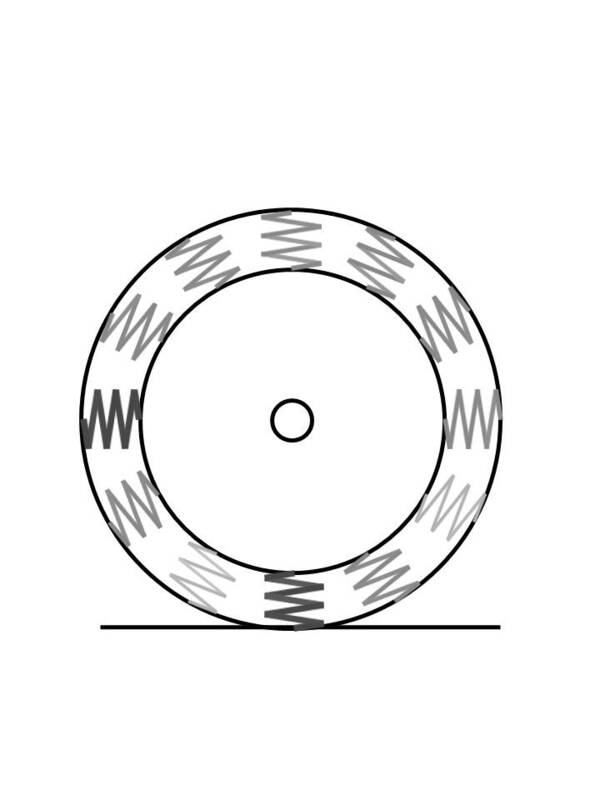 Side Note: Rims also have harmonics and non-uniformity, but you can directly measure non-uniformity as run out. About 0.001" of runout ~= 1 pound of force variation. Again the 1st harmonic's peak could be in a different location than the composite's peak. As I said earlier, vehicle suspensions react strongly to Radial 1st Harmonics. Not so much with Lateral 1st Harmonic, and even less to Tangential force variation. Because both rims and tires can have 1st harmonics, you can take advantage of this by mounting the tire's R1H high point with the rim's R1H low point. Other vehicle manufacturers require different marks. For example, BMW requires a white dot for the tire, and a white dot on the valve cap (the valve hole is drilled at the low point). Toyota requires a red dot and the valve hole drilled at the low point. General Motors does not match mount, so no marks! In the replacement market, there is no standard way of marking the rim, nor marking the tire. Some tires use a different color, some don't mark the tire at all. Plus it is questionable what the rim manufacturers are doing. 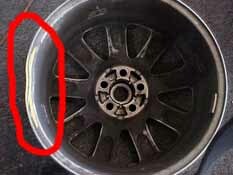 Some have said to look for the yellow dots on the tire and match them with the valve hole in the rim. While there is no harm in doing this, this is not an assured thing. Some folks think this matching is for balance purposes, but this is always done for reducing the Radial 1st Harmonic. I hope it would be obvious from all this that force variation has nothing whatsoever to do with the weight distrbution within a tire and therefore, there is no connection with balance. Put another way, you would be mistaken if you think matching the marks is reducing the balance weights needed. I was reminded that grinding the face of the tread to reduce the force variation is still a common enough practice to comment on. The photo to the right is what a POOR example looks like. 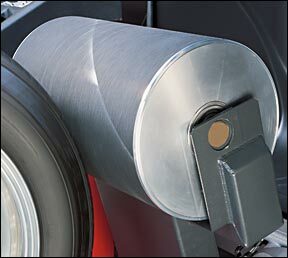 Grinding is usually used to reduce the R1H value of the tire. although it can be used to change quite a few different uniformity properties, including conicity. When done correctly, the grind should be barely visible. In other words, the grind should not be deep (we are talking thousandths of an inch, here! ), there should be very little dust and there should be an ever so slightly visible texture, with, perhaps, a little bit of "heel and toe". Sometimes a bit of the stripes or the letters would be removed. To my knowledge, no adverse affects have been found when tires are ground properly. 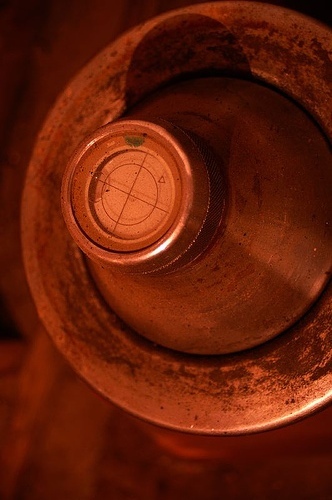 Every vehicle has a certain level of sensitivity to a wheel end vibration. This sensitivity will vary by wheel position – front to rear, and somewhat from side to side - making each wheel position different. As a general rule, the most sensitive wheel position (to the driver, which is who is usually judging the vehicle) is the Left Front, and the least sensitive position is the one farthest away – the Right Rear. Tires are a major contributor to wheel end vibrations, but sometimes get unfairly judged as the sole source of the problem, because there are many vehicles that have incredibly stiff chassis's, which aggravates the situation. To the right is a typical range of values for various components that can contribute to wheel end vibration. Please note the values are unimportant, except for their relative value to each other. Please note there are other components but this list is just for illustration. Also note this assumes the tire and wheel assembly is balanced off the vehicle. If the vehicle has a sensitivity to values over 10, then this vehicle will not have a perceptible vibration. Since all these values are maximums, then it doesn’t matter if any component is at the maximum – no perceivable vibration. 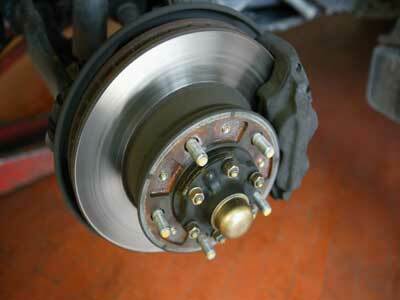 Brake Rotor Balance – A brake rotor is made out of metal. It is machined, and its outer diameter is much smaller than any other wheel end component That’s why vehicle manufacturers put relatively tight limits on brake rotor imbalance and with such low values, these couldn’t possible be the source of a vibration – Right? But if you look closely at the rotors, you may find balance weights in the vents, or grind marks on the outer rim, so does that mean they are always in balance? I think not! Off Center Wheel Mounting – Wheels are supposed to pilot on the center hub, however there is a little clearance so the wheel will slide easily onto the hub. Since the hub is machined and the wheel is probably machined, this also should never be the source of a vibration. But many after market wheels DO NOT pilot on the hub. They are piloted by the lugs (lug centric, as opposed to hub centric). It is widely known that the lugs are very difficult to make on-center and perpendicular to the mounting surface. For this reason, most aftermarket wheels come with hub rings, that have to be sized correctly for your particular vehicle. Rim Runout – Alloy wheels are generally machined, so in theory, they should have no run out, but variations in mounting the wheel during the machining process result in some small amounts of run out. 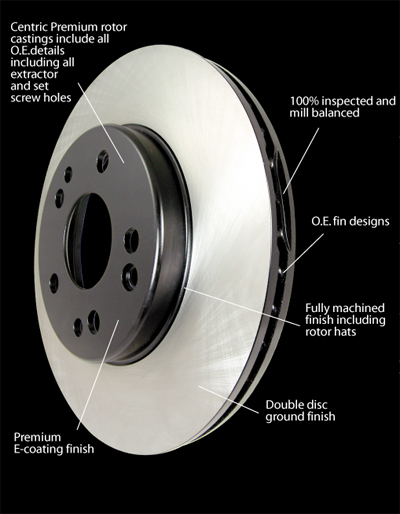 Even though these are also made of metal and machined, because they are larger (and therefore more difficult to manufacture) and at a larger diameter, vehicle manufacturers’ tolerances are typically larger than brake rotors for both imbalance and runout. Tires - These are just large balloons, making them difficult to manufacture to tight tolerances. Plus they are the largest diameter items and therefore small variations will have large effects. For this reason vehicle manufacturers also allow tires to have the largest tolerances. So what happens when there is a sensitive vehicle (say, with a limit value of 6) and we use the same tolerances. OPPS!! Vibration! It’s only when the tires are near zero that the problem completely goes away. But the fact is that changing tires can make the problem go away leads many people to think the problem is strictly related to tires. 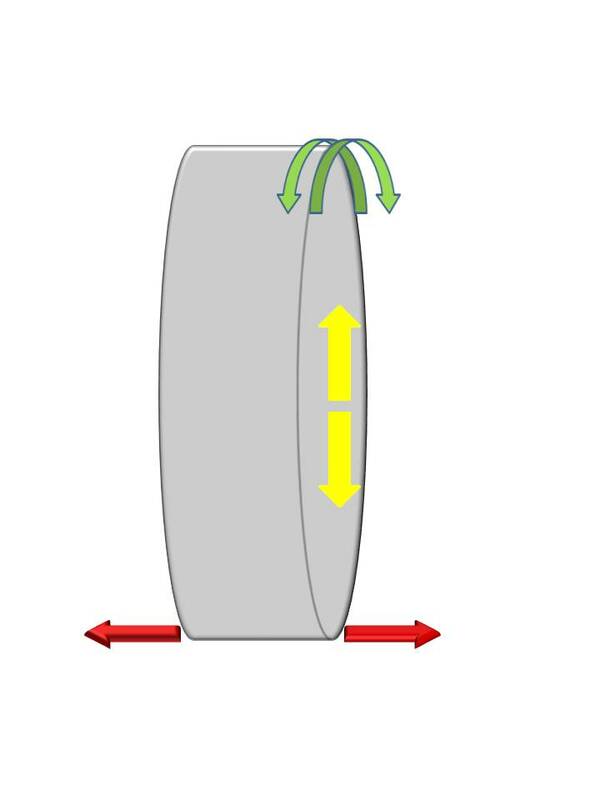 A complicating factor is that tires must be mounted on a rim and therefore, the variation of the rim affects the tire variation, sometimes even magnifying the variation. If the brake rotor has a lateral variation at the hub of 0.002” – a very small value – which is occurring at 2” in diameter, then the variaton at the tread surface (30” in diameter) would be 15 times that value – 0.030”. Any variation of the other components could add to that, making the vehicle vibrate, even if the tire is PERFECT!! Care must be taken when dealing with vibrating vehicle to assure that the whole picture is understood. When a change in tires does not fix a problem, the next logical step is to look at the rims. Don’t forget that Hunter GSP9700 has a built in tolerance for wheels, but its value is the same as the entire assembly – meaning that a wheel with an excessive amount of run out will be judged as acceptable.